When you start a business there are initial costs such as insurance premiums, website packages, stationary and accountancy fees. To keep everything tidy from the outset it is a good idea to loan your business some money whilst you’re waiting for payment from your first customer. You’ll need to use a director’s loan account in inniAccounts – this is an accounting record of money being borrowed from or loaned to your company. By default the director’s loan account is enabled in inniAccounts but should you ever borrow money from your company using a directors loan, please read this alternate guide. A common mistake when recording a loan in the business account is to use the ‘Enter New Transaction’ and then selecting ‘Enter other income’. The problem with this is that this type of income gets recorded against your sales and your sales are what your tax calculations are based on. Using a director’s loan ensures that no tax is paid on the money when it enters and leaves your company. Once you’ve decided how much you are going to loan your company, your next step is to transfer the money from your personal bank account to your business bank account. You can then record this transaction in your books against your Directors Loan account. In your bookkeeping area, select the director’s loan account. Click ‘Enter New Transaction’ then select ‘Transfer to another account’. Enter the date, description, amount, and select transfer to Business Bank Account. If for example you are lending your company £1,000, enter this as a positive amount. Check the matched box and then press Save. 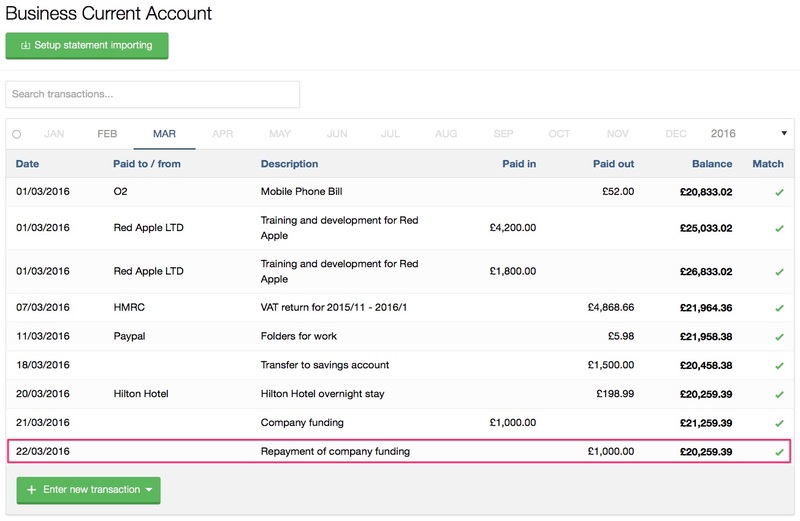 This will now show a balance of -£1,000 on your director’s loan statement which indicates that your company owes you money. Now select your Business Account from your bookkeeping area. You’ll see a transaction has been created automatically for the director’s loan £1,000 credit. This transaction awaits matching (reconciliation) that you have paid the money into your business account. Simply edit the transaction and check the box to match the details (date and amount) in inniAccounts so they match exactly those shown on your business bank statement. You have now successfully loaned your company money and recorded it in your director’s loan account. This is reflected on your Balance Sheet that you can find in Reports in your Taxes and account area, and also in your LiveCash. The next section of this page explains how you will handle the repayment of the loan in inniAccounts. When you company has adequate cash to repay the loan, the reverse of the previous actions needs to be taken to clear your director’s loan account. In the bookkeeping screen, select the Business Bank Account. Click [Enter New Transaction] > [Transfer to another account]. Enter the date, description, amount, and select transfer to Directors Loan account. This will show on your business bank statement in inniAccounts as £1,000 paid out. You can pay the money from your business account and mark that transaction as matched. Again, as a result your bank balance should match again exactly that shown in inniAccounts. You now need to update your director’s loan account to match the transaction. From the Account list you will need to select Directors Loan. You’ll see the £1,000 transfer has been created automatically in the director’s loan account which now needs to be matched. If the full balance of the loan has been paid, the balance of the director’s loan will equal zero when then transaction has been edited to matched / reconcile it. Your director’s loan account is now up to date. If your company has not repaid the full amount of the loan, the remaining balance will be shown on the director’s loan account. If you have any questions or comments you can post them here. We'll aim to post a reply as soon as we can. If you're an inniAccounts client you may prefer to contact your account manager. I haved paid myself back the full amount , through money I have taken through sale of products. However my accountant is adamant that it is shown as takings but this will mean I will pay 20% vat and will only get in theory £800 back. Is this correct or not. Hello Andy! If you have lent your company £1,000 then the company will need to repay the full amount. However, you cannot do this by just taking the money directly out of sales income without recording this correctly in your business. If you are VAT registered then the VAT will need to paid over to HMRC and also the income will form part of the profit for the year in your year end accounts, which will then be liable to tax. My Director who has loaned to the company of 1 million , he required the loan interest received every month to be reimburse back to him. For this case, what is the description I need to state to avoid be query by auditor and is there any tax implication involved. When a director loans a company funds with a loan agreement in place stipulating interest rates this would need to be expensed to the profit and loss accordingly. You should categorise this with an appropriate heading usually under the interest payable and similar charges section of your accounts. The company would be able to claim corporation tax relief on the interest charged and the director would be responsible for reporting the interest received on their self-assessment tax return. Is there any limit on lending money to business from personal account? No, there isn’t a limit for lending money to your company from your personal account. Hi, Rowena, I have loaned my small ltd company over £66.000.00 pounds over a decade now, the company has ceased trading to the public, but is registered at Companies House, as I plan to sell part of the premises to recoup my director’s loan. Will I be able to take all of my loan back before capital tax kicks in on the profit made by selling part of the property? Hi Neil, unfortunately I do not have sufficient information to reply to your specific situation. Hi, Rowena, what further info would you require from me regarding supporting my company financially for a long period of time. would I be able to claim all of my directors loan back or is there a limited time issue here.basically I intend to sell part of the premises to recoup all of my continuing loans. regards neil. I have taken a personal loan to fund the opening of my company. Can I post the loan on the company accounts and how do I go about the interest payable? Would this go to directors loan account? The company is not vat registered. You can lend the money from the personal loan to your company and this should be treated as a Directors Loan from you in the accounts. You will need to make the loan repayments personally, however, the company can make repayments to you for the same amount if necessary, thus paying back the directors loan. If you charge interest on the loan to your company then this should be paid to you with 20% tax deducted and this income tax reported every quarter using form CT61. The interest is tax deductible for the company and must be included as income for you on your Self Assessment Tax Return. VAT is not applicable in this. I have give a director’s loan to company, I came out of the company and company signed the director agreement to pay me back with specified terms, I am not in company any more and this has been signed on the same day that I came out of company. Company now saying they wont pay money as they don’t have any money, I want to know, can I take the company to court and enforce them to pay me regarding the agreement they signed? can this court order finish with getting warrant if they wont pay? As I am out of company now would I count as normal third party debtor? I know company has asset to pay if court order them I have called the accountant of company, she is chartered accountant, she said because it was director loan, you need wait and you are on the bottom of pile of debtor if any, then if company make profit you will get your money otherwise you can not get your money, she mentioned new directors can not take money unless they pay you first, but if they wont take money and company does not have any money to pay you, you can not do anything and just need to wait as this was director loan. Having said that the director loan has been signed on the day of I resigned from the company where I transferred my share to new director and new share holder but in the minutes of meeting we mentioned that new director are aware of this loan and its terms. So can you please advise if I can take the company to court not as x director calming director loan , but as third party debtor. please note the title of loan mentioned “director loan”, however there is no terms that specified I have to wait till company making profit, it’s just simple director’s loan agreements and payments terms. Unfortunately I am unable to answer a question like this through this medium so I suggest that you consult a Lawyer. It is best to use this description on your statements as a matter of clarity. I would like to extract my 19000.00 as we have a healthy bank balance can I write myself a company cheque and pay myself back? Hi Patricia. Yes, if you are owed money by your company you can repay this to yourself. The loan account of the other director should be treated completely separately. I have a large toy collection and am going into business trading toys online. I want to use part of my collection as the initial stock for sale. Can I give the business a loan of goods rather than cash? If so how would I prove that the value of the goods was genuine and not inflated to reduce profit and therefore tax? Also, can I subsequently sell items from my collection to the business with no personal tax implications? You can put the value of the initial stock into the company as a loan from you and this should be valued at ’the lower of cost and net realisable value’. Net realisable value is the expected sale price less any costs required to get the goods into saleable condition. You should be prepared to have some documentation available if any queries are raised by HMRC. If you are selling goods to the company then the proceeds need to be declared on your Self Assessment Tax Return as personal income to you. You can loan money to your business without a loan agreement or any other paperwork and do not need to charge interest on this. You may lend the money in another currency but this will need to be converted into sterling for your accounts. If I loan my new company a sum of money. The company then trades for a year. I then want some of this money back. Can I take it pre corporation tax or must it be taken post corporation tax? After all it is a debt. No interest will be charged, only repayment of my capital. Once the loan is re-paid the company would be quite strong and pay corporation tax as normal. If you lend money to your company you can repay this to yourself without any tax implications once the company has the funds to do so. The corporation tax payable is not affected as a loan does not increase or reduce the taxable profits as it is not trading income/expenses of the company. It’s amazing that there is this forum available to help those in business, thanks so much. My question is: Where on the small company abbreviated annual accounts for companies house do I declare the loan that I have made to my new company? Thanks again for being available to help with accounting issues. Hi Alex. A loan made from you to your company will be included on the balance sheet as part of the creditors figure. My dad made a loan to my company, he is not anything officially to do with the company. I now have the funds to repay his loan from the company. Can I just return the exact amount that was lent. He does not want any interest ect as he is family and was just helping me out. Hi Robert. Yes, as it was a loan you can just repay the same amount back. I have just set up a small limited company. I am going to loan the company some funds for initial running costs, but can I include my directors salary in that? i.e., i loan £10k, but pay myself m a director salary from that 10k each month, until the business has earn enough to pay me back the full 10k? There is no reason why you can’t lend an amount to your company and then use the loan to pay the initial running costs which include a salary. I am in the process of setting up a limited company to buy and let property. Can I give a directors loan for the full value of the property and then extract it at a later stage as the profits allow? Also is there a limit to how much I can put in please? Hi Kevin. You can lend as much money as you wish to your company and repay this once cashflow allows. I have received conflicting advice I hope you can straighten out. I lent my company £100,000 which was used to purchase assets but would like to withdraw some from the DLA. As the only income from the company is as yet untaxed, I am correct in thinking that if I withdraw £40,000 then the company must actually have made a profit of £50,000 and paid tax of £10,000 before I can withdraw the £40,000. Alternatively, if I withdraw the £40,000 then the company has only £10,000 left and taxation on that would be £2,000. Hi Andy. Unfortunately it isn’t as simple as that. The company profit and your director’s loan account are not linked. You can withdraw the money in your loan account at any point when the company has the cash and this will not affect the profit or the amount of tax that you pay. The taxable profit of the company is calculated and corporation tax paid on that figure, you are best to speak to your accountant who should be able to look at the figures for you. I lend a company £55,00 and if I want to write off the amount I lend to the company. Do I need to pay any tax if the directors loan is written off? Hi Jagath. There are tax implications of writing this loan off and it can be quite complicated particularly if you are connected to the company. Therefore you need to get specific advice regarding this from your accountant. Really interesting and helpful to read all your repsonses. I started a Ltd company over a year ago. During the last tax year Apr15-Mar 16 I bought a van for the company costing £2,000 using my own money. Am I right in thinking that this counts as a directors loan even though the money was paid directly from my personal account to the seller of the van? Also I have been paying the van insurance myself for the first 12 months whilst we were building up cashflow, am I also okay to include this as a directors loan? If so – I am getting to the position now where we can afford to repay back these loans to me – does it matter that the loans were made in the last tax year and repaid this tax year? Is there a time limit in when these loans can be repaid? Hi Paul. As you purchased the van and insurance for your business then yes, the amounts paid are a loan from you to the company. The amount can be repaid to you at any time without any tax implications, there is no time limit, the balance remains in your company as owing to you until it has been paid. my directors loan is shown as a creditor on the balance sheet . I know this probably a stupid question , but when i repay it what is the repayment shown under on the balance sheet? When you repay the loan to yourself it is just allocated against the creditor already there so this amount reduces until it is fully repaid. Hi we opened our limited car company 2 months ago & bought some cars using a directors loan, however we did not put any money into the business account & although cars have been sold there is not enough profit in there to pay the overheads, are we able to transfer some money from our personal account to the business account as a directors loan even though the company is now up & running? Yes, you can lend money to your company whenever you wish. This can then be repaid to you as soon as the company has the cash available. We have just started a new company and have not been withdrawing salaries.We have also lent money to the business as consultants .How do i treat these inthe balance sheet. Hi Thelma, If you have lent money to your company this will be shown as a creditor in the balance sheet and can be repaid to you once the company has the funds. If you have processed the salaries via RTI then the unpaid net amount will also be shown as a creditor. I would like to loan my business (Ltd Co) £50,000. To enable me to receive interest on the loan do I need a formal loan agreement in place? Does it matter how quickly the money is paid back to me? ie will that affect how much interest I can claim. If you are a director of the company then you don’t need a formal loan agreement in place and you can repay this to yourself at any time, once the company has the cash available. There are various rules around the payment of interest therefore you are best to speak to your accountant before making such payments. I resigned as a director of a company several years ago, I left the company with it still owing me £28,000.00 Directors Loan with a agreement in place that the company would pay me back the £28,000.00 when it was in a position to do so. I am still a shareholder of that company. It’s my belief that the Sole director of the company in question has no intention of paying me back my outstanding £28,000.00 and as such I would like to issue a statutory demand against the company for the £28,000.00. My question is, am i considered a creditor of the company? If so, Its my understanding that I can legally try to recover the monies owed to me. Is this the case? If the company owes £28,000 to you that you loaned then you are a creditor of the company. You will need to speak to a Solicitor regarding the recovery of the money. In a Ltd company with 2 Directors can one of the directors take out £10,000 of his Directors loan without discussing with the other shareholder, taking this money will leave the company with a zero balance and at risk of bankruptcy. If the money is due to the director and the company has the available cash then he is within his rights to repay this. However, if then means that the company is unable to meet it’s other liabilities and it becomes insolvent then this would be preferential and a liquidator would look to recover this amount. I set up a limited company in February. Prior to setting up my limited company I paid for professional training and website set-up costs that enabled me to become a commercial entity. I would now like to record the payments I made from my personal account as ‘money lent by the director’. Is it possible to create back-dated ‘money lent by the director’ records in this way? Is this the best way to handle this type of scenario? Unfortunately costs for training taken prior to incorporation are not allowable but other business costs are. As long as the expenses are legitimate business expenses solely for your Limited company then you can claim these. They cannot be backdated to before the company was formed therefore they should be recorded as though they were incurred on the date of incorporation. You can either treat the money paid personally as a loan or just put in an expense claim if the company has the cash available to pay this. Hi Rowena, we are a small limited company and we started the company off buy paying into it with money from our own personal accounts. We cannot pay this money back to ourselves in full as we have not made sufficient profit but we would like to pay it back partially. Is this possible and is our company liable to pay tax on the loans we paid into the company? If you have lent money to your company then you should keep a record of this as a Directors Loan account. The company can repay this when it has the cash available to do so in as many instalments as you wish. The balance will just show as still owing to you. There are no tax implications to the company in receiving the loan or making the repayments. I am a co-founder in my LTD. 6 month ago I lent £ 50,000 to my company. At once there is no any possibility for the company to repay this loan. How can I manage this situation? What tax consequences for the company might arise? There are no tax implications for you lending money to your company. This will remain in the balance sheet as an amount owed to you and can be repaid when the company has the cash available to do so, in as many instalments as you wish. Any balance will show as still owing to you. If I set up a company and loan the company £150,000 to buy a residential property, can I repay the directors loan with the rental income that is generated such that the company does not make a profit and hence no corporation tax is due [until the loan has been fully repaid] ? Hi Paul, When funding a limited company privately this will become a directors loan account which you can then drawn down from available funds of the limited company. Any rental income would be considered revenue within the limited company and subject to corporation tax. In general terms a limited company can operate the business of running a pub. However there may be commercial reasons why they require the lease in a personal name. It would be best to seek specialist advice as this could be a contractual matter. I am a ltd company which consists of only myself and my wife.I have a company bank account which the accountant told me to run as a regular bank accountant as it was only a small business. I only sub contract to one company who take my tax at source,the rest I use for expenses (which are accounted for) and everyday living (which aren’t). My accountant this year has changed and he says I’ve got a directors loan accountant which is in arrears of 58,000. My current income gross is around 100,000…ive never even heard of directors loan .. When taking funds from a limited company these need to be supported by relevant documentation so any salaries taken would agree to payroll submissions to HMRC and any dividends taken would agree to dividend vouchers. Any funds extracted from the business without the appropriate supporting paperwork would be considered a directors loan (money borrowed from the business). If your company bank account is paying for personal items they would be considered loans from the business also. I have set up a limited company to buy and hold property and have lent the company £200K. I dont intend to charge interest and will take repayments from the rental income of the properties accrued by the company. Does corporation tax have to be taken from my company’s rental income first before I take the loan repayments or are they ‘tax free’? Corporation Tax is charged on the company’s profits. The loan repayments to yourself do not affect the profits, they will reduce the amount owed by the company to you. Myself and a family member are thinking of setting up a limited company to buy and sell property. We are planning on investing equal amounts as directors loans. When it comes to repaying the directors loans can we repay ourselves out of the profit from our first sale? Instead of a mortgage to fund part of the purchase of our first property a family member is willing to give us the funds to buy the first property and let us keep all of the profits (if any) and only wants the loan amount back. If we sell the property and make a profit and pay back the loan in full to the family member will there be any tax complications on the family members side? I know we will have to pay capital gains tax on the Profit made from the sale. Hi Daniel, Directors loans can be repaid as and when cash flow allows so you can repay yourselves from the profits of the first sale. There would be no tax implications for the family member who would be loaning you the money to fund the property purchase. How do I enter an amount as a Director’s Loan when there was no cash paid in to the company. This is in relation to not taking salaries during the set up period and the intention is to repay the DL when the business can afford to. The only examples I can find adds the amount as a credit in the bank account. As long as the director had a payroll scheme setup that was in operation during the setup period, and salaries had been declared to HMRC under the RTI scheme. You can credit the director’s loan as this will be money owed to the director not yet taken. Hi. If a director loaned the company £100000 in 2015/16. Interest was calculated but not withdrawn from the company. do I add the interest amount to the directors loan account? Then in 2016/17 the interest calculated would include previous interest amounts. If the limited company has not physically repaid the interest to the director then the value of the interest would be credited to the directors loan account to increase the outstanding directors loan position (£100K + interest). Interest is not usually compounded in such loan agreements but this would be determined by the parties involved i.e the limited company and the director. When making director loans to the company it is usually best practice to have a loan agreement in place, preferably at a commercial rate of interest. Please also be aware that the limited company paying interest may be required to meet additional HMRC reporting requirements. Hi Rowena, I have set up a company to buy and sell properties. I have an existing company which I use for provide IT services. Can I loan money from my IT services company to the property company with no fixed date to repay the loan at 0%? If so, where can I find sample templates to set up such an agreement? When making loans between companies under common control it is best practice to set up a loan agreement in line with what would be available from third party lenders. HMRC may review a loan at favourable terms between connected companies under common control and may look to tax this as if it had been revenue income on the director/shareholder. If you need help setting up a legal agreement it is advisable to speak to a solicitor. I am director and sole shareholder of two small companies: company A sells things and company B has a buy-to-let property. Company A has some spare funds (after making allowances for financial commitments such as CT) and company B is breaking even (again, after making provision for CT, etc.). I have a DLA with Company B which is in credit by a few hundred pounds. Can company A make a loan to company B and the loan is then used to pay back the money that company B owes me? Logically, I can’t see anything wrong with that, but does my role as director of both companies create any kind of issues? Any genuine business expenses paid personally by yourself (the director) can be recorded through your director’s loan account. The accounting entries would be DR Expenses/Assets CR Director’s Loan Account. I am starting a property investment ltd company. To start up, I am going to borrow money from my bank as personal loan, and then lend this amount of money to my company as a director loan. The company will pay me the capital and interests, and then I transfer all these repayment to my bank. For this transaction, is there any tax implication for both the company and my person income? From my understanding, the company will enjoy less corporation tax, since profit is reduced for repaying capital and interest. And I didn’t take any income in any kind during the transaction, then I don’t need to pay for extra, but just report hmrc by submitting CT61 quarterly. Am I right? Thanks. The loan interest will be classed as a business expense and therefore the company will receive 19% Corporation Tax relief on the interest. As the loan interest will relate to a personal loan that you have provided to the company, the interest repayments will need to be declared on your Self Assessment Tax Return as income received and you will be taxed on these payments accordingly. As already mentioned you will also need to report the interest payments to HMRC using a CT61 form. My company has 2 shareholders my dad(49shares) and i (51 shares & i am the only director). The company owes me a directors loan of 288k, and has carried forward losses of 25k. There is cash at bank, however, of 8000 after all expenditure to 31st Mar 2017. There are no liabilities other than the DLA. I have used up my dividend allowance for the tax year already but can i legally declare & pay only my dad a dividend for him to take advantage of the £5k dividend allowance even though the company has a liability to me of 288k and given it also has carried forward losses? Do paying off losses always rank ahead of paying a Dividend? Any help you can offer would be hugely appreciated. Hi Ross, Dividends can only be distributed from available profits so if the retained losses brought forward exceed the profits in the year there will be no funds to distribute any dividends. If profits are available then these can be issued to the shareholders based on their shareholdings. My business partner has lent money to a company we jointly own from an investment company that he solely owns. This has been done without any loan agreement being in place at all. Q1 Is he entitled to call in the debt at any time. Q2 Can he take money out of the company whenever a positive balance in the debtors account is available. Q2 Can he charge interest on that debt. Generally speaking when a connected party makes a loan between two companies which they have a controlling interest, it is appropriate to ensure a loan agreement is in place and to charge a market rate of interest. If the loan is done on favourable terms HMRC may consider the loan to actually have been an income distribution to the individual in the lending company. Without any loan agreement in place there is no document to establish the entitlement to recall the loan or when repayments of the loan should be made or even if interest should be charged. Directors of the company borrowing the money must act in the best interests of the company and ensure the loan is managed with no detriment. I setup a new Public Limited Company on the 21 /12/2017 which I’m going to use to purchase a flat off-plan. I’m planning to use the flat as a Buy to let investment. The flat comes with a guarantee of 7% assured/guaranteed net rent per year for three years after completion. I would like to understand how I could loan the two 25% of the payments to my company from my personal savings in order to pay the developers. I would then like to also understand the best way to operate my new company so that I will be able to get a mortgage to pay off the final 50% of the purchase price due upon completion in September 2019. I would like to understand what I could do from now until then to ensure that I will 100% be able to get a mortgage to pay for the final 50% come September 2019. The development has a long stop date of September 2020 and so even if there are delays is will have to complete by September 2020. I do not need the loan paid back to me until the year 2021 onwards. Would it be best to instead make the deposit payments from my own personal bank account so that it is not present on the company’s financial record? When introducing money into the company as a director this is done through a directors loan account and can be repaid to the director as and when cashflow allows. In regards to mortgage applications we would recommend you contact a mortgage advisor who specialises in this area. For the limited company to own the investment property the financing will need to come directly from the company, not you personally. As a director of a company, my fellow director who has loaned the company £17000, now wishes to take his loan back. The company has £32000 in the bank account so can pay back the loan. However the actual free cash situation taking into account all other debtors and creditors is only £5880. So if he takes back his loan the company would be operating whilst insolvent. As a director I am obliged to pay back directors loans but I am also obliged to run the company responsibly. As a director of a limited company you are legally obligated to act in the best interests of the company. In this case, the best interest would be to settle any debts before repaying the directors loan. You could pay back part of the directors loan and spread the rest of the repayments out when the funds become available. If the company was to become insolvent then preferred creditors such as HMRC would be first in line to receive any funds held by the company. Any directors or shareholders would be last in the pecking order. I’ve had my company for a about 5 years but stopped actively trading 2 years ago. I had a healthy amount of funds in the company accounts and was paying myself a small wage / dividends as normal in tax year 16-17. I was planning to stop paying myself after the march 17 payroll leaving approx £2000 in the company account to cover basic things like account fees whilst I was on a long term sabbatical. Unfortunately I forgot to zero my payroll payments until Jun-17 had run meaning I owe myself more than the company has available. is it possible to put the company dormant whilst still having a CREDIT in the directors loan account? If you have incorrectly run a payroll amount then it may be possible to speak to your payroll provider to issue a revised payslip and submit this to HMRC. There are no restrictions to making a limited company dormant where the director is still owed money from the company this would just form a creditor position within the dormant accounts. Hi, I set up a company in April 2017 and since then have loaned the company £9,000. From that loan the company has purchased a van. The company has repaid £3,000 of the directors loan but still owes me £6,000. How does this affect the company accounts in April 2018 as the van is an expense of the business but at the moment the company still owes £6,000 to me and only has £1,500 profit. Will all this show that our business has made a loss if it owes £6,000 to me but does not have enough funds at the end of our first year to repay that £6,000? Surely the £9,000 lent, the £3,000 repaid and the £6,000 outstanding has to be taken into account otherwise the van as an expense cannot be included on the accounts, which wouldn’t make any sense. When a company buys an item such as a van this would would be shown in the accounts as an asset. If the van cost £9,000 it would be shown on the accounts at this value less any depreciation accounted for based on your accounting policies. For example a 25% straight line policy would value the van at £6,750 as at the year end. The purchase of the van would not impact the profits as this is not expensed to the profit and loss account but is instead reflected on your company’s balance sheet. The cost of the van can be claimed as a capital allowance which will reduce the Corporation Tax payable by 19%. If monies have been supplied to a limited company via a directors loan then this would be classified as a creditor on the balance sheet in the accounts as the company owes the director that money. If monies have been loaned to the director from the limited company then these would be classified as a debtor on the balance sheet. When making directors loans it is best practice to have a loan agreement in place to cover the terms of the loan and any interest being applied. Interest on directors loan accounts would be expensed to the profit and loss account accordingly. My father made a loan to his own company of £400,000 several years ago, which was used to invest in its development. He is still owed this amount, but due to ill health the business is likely to be closed later this year and will not have the resources to repay him. If he writes off the loan will there be any tax implications to him personally, or to the company? As the company may be considered insolvent due to monies owed to the director it is advisable to speak to an insolvency practitioner to ensure you remain compliant when closing the company. Due to the large value of the loan it would be best to speak to a tax advisor to see if any reliefs can be applied in terms of the loan made should it be forfeited. I set up a company to buy a property. However, I had to pay initial deposit and some expenses while a bank account was being opened. How do I adjust these expenses against the company? A loan, or a company expense? If the initial deposit was substantial then this can be recorded as a directors loan account where the property company owes you for the deposit paid personally. For any expenses that are allowable expenses for the business these can be treated as expenses within the company and repaid to you when funds are available. Having read the questions and answers I am a little confused regarding the subject of loan repayments and tax deduction. 1.If I loaned My LTD Company £40,000 from my personal account and wanted a repayment plan of £10000 per annum and no interest charged, does mean my new company will have to pay tax on its profits before it makes my loan repayments? 2.What if the money was loaned from a business or an investor? Most importantly what is the company only made £10000 which is then used to pay the debtor? Does that mean the company is liable for tax?? Your help clarifying this will be greatly appreciated. The directors loan repayments will not be deducted from the company’s profits. If you did wish to charge interest on the loan then the interest element would be treated as an expenses in the company’s accounts and incur Corporation Tax relief. If the money was loaned from a business or an investor then only the interest element of the repayments would be allowable for Corporation Tax relief as above. The capital element will reduce the loan balance on the company’s balance sheet. If the company makes a profit of £10,000 it will be taxed at the appropriate rate regardless of whether the money is used to repay any loans or not. If I loan my company money for a capital purchase and the interest paid back to me has 20% deducted… where does the 20% deduction go in the company accounts? Say I loan the company £10k at a rate of 5%. I presume the company pays 4% back to me annually, ie £400, but the interest payments were £500 (taken as tax relief), but where has the other £100 gone? The interest paid on your directors loan accounts will be paid net and the company will pay over the tax deducted via a CT61 form (usually submitted on a quarterly basis). The tax that has been deducted from your interest payment i.e. the £100 can be reclaimed through your Self Assessment Tax Return. You can still claim the gross payment of the interest as a business expense against income to reduce the profit. I have read through the questions on this site and think I have the answer to mine. However it does seem unfair! I have loaned my daughter’s company £100,000. She is in a position to repay some of this back The company will have made a profit of £20,000 this year which has only been able to be realised because she has used the £100,000 loan to buy stock. If she repaid me £20,000 out of the profit and loss then her profit would be zero. Bearing in mind that she has only been able to make these profits because of the loan. If she has to account for the refund in the balance sheet – reducing the loan to 80,000 then she will have to pay tax on the profit. Can you clarify this position please. Tax is payable on profits earned so if the company has made a profit of £20,000 then the tax will be due on this at the appropriate rate. As the loan is a balance sheet creditor then any repayments of this loan are used to reduce the creditors position and will be recorded to the balance sheet. Profits do not always mirror cash available due to reporting requirements and timing complications. Future cash outflows such as corporation tax reduces funds available to repay any creditors including loans. If I were to lend money to a new property company I want to start, in order to buy a commercial rental propriety and a residential rental property – and say it costs me £75,000 each property and so I lend the business £150,000 – when the rent starts to come in, would there be no profit and so no tax payable until the loan was repaid? In effect, the rental would just accumulate in the business until a point that the loan was repaid? Corporation Tax would still be payable on the profit made by the rental properties despite there being a large liability (amount owed to you) on the company’s balance sheet. The rent received less any expenses and Corporation Tax can be used to repay the loan balance. I have for years been trading as a sole trader building 3 new houses and later purchasing land which I subsequently obtained planning permission on. I sold the land on last year and will be liable for forty five percent tax!! My accountant has always steered me away from registering as a ltd company ( he is not chartered) stating the problem arises when taking the profit out of the company. He has wrongly advised me and now I will have to pay the price. Today I formed a ltd company and next week wish to bid on a property at auction. I have not yet set up a buisness bank account. If successful in my bid, can I pay the property deposit out of my personal account and class it as a directors loan when the buisness account is opened? The completion sum would also need to be a directors loan and also the refurbishment costs but the account should be set up by that time. When purchasing an asset for a limited company using private funds the funds will be recorded as a director loan. Please note that the deeds for the property should be in the limited company name and you may need to verify with the auctioneers that your proposed funding method is acceptable prior to bidding. Hi, My company ceased trading at the end of November 2017. It was a not-for profit company limited by guarantee that has only been trading since August 2015. Each year it has made a small loss. The 2 company directors (myself & my husband) lent the company a small amount of money. We now wish to dissolve the company, but the balance sheet shows that the company owes us both a small amount of money (£272). We are not bothered that we have not been repaid this money, we just want to close the company as soon as possible. I am about to submit the final HMRC Tax Return but am wondering if it is okay for the balance sheet to show that the company owes £272 (even if it is to us). Will HMRC allow the company to be dissolved? When a Limited company is closed and considered insolvent at the time there may be a requirement to use a insolvency practitioner. However if the amounts are small and in relation to the directors of the company then HMRC may allow the company to close without contesting this, as long as third party liabilities have been met such as any tax. It is always best to speak to a expert in company closure to ensure any action you take is correct. Generally speaking, Directors Loan Accounts are repayable on demand and therefore are shown as a creditor owing within one year in the accounts. My son is starting up a business I will be investing £60k and will be a 10% shareholder but effectively a silent partner , he and his business partner will be investing 10k each . However providing they each get a £25k personal business loan they will then be investing a further £25k into the business to help with cash flow in early months trading. With regard to their £25 k, they intend to inject that into the business as a directors loan then take monthly payments back to help pay off the personal business loan over 5yr (with the same rate of interest as they are being charged by the lender) . My question : is this the best way of paying back the business loan or should they just increase their salary to cover their personal loan repayments.? They have also suggested that of my 60k investment , 25k should be as a business loan on same terms. Remuneration planning for directors who are shareholders can be a complex area and tax efficiencies may mean that paying a higher annual salary from a limited company may not be advantageous. When directors have loaned a company funds then any repayments of these would be tax free due to it being repayment of a loan and not income. The interest element of the loan repayments that the directors receive may be taxable however the rate of tax payable will depend on their personal tax situations. This would apply to you also if £25K of the amount invested is to be treated as a business loan. If £25K of the money put into the company is to be treated as a business loan then this means that you will be paying less for your 10% share in the company as it would be bought for £35,000, not £60,000. I have a question regarding “Money Director Lends to the Business”. I have 2 limited companies A and B. At the start of the year, I had put £30k of my own money into Company A (it is a food start-up) which hasn’t been generating revenues as yet. Separately, I earn living from Consulting business for which the revenues are recorded in Company B. My question was, whether it would be feasible for me to re-direct some of my invoices from Company B to Company A, and then be able to extract the £30k which I had put in Company A? Any money that you have introduced into the company as a directors loan can be repaid to you as and when cash flow allows. When combining trades HMRC may have restrictions on how losses are utilised within company A. The temporary nature of this arrangement may also be considered by HMRC as tax avoidance and could be contested. When you own and manage two separate limited companies there is nothing preventing company B lending the money to company A which in turn allows company A to return the directors loan to yourself. When having loans between two connected limited companies it is common practice to ensure this is at market rates and repayable on demand. Hi Rowena, we(me + my wife) have opened a limited company to buy a residential house on a buy to let mortgage in company’s name. for the deposit(150K), we were thinking of giving loan to the company.Do we need to create a legal document to materialise director’s loan given to the company? If yes, what would it constitute? Also can one director give all the loan to the company or do we need to divide the amount between us to give to company? Many thanks. As directors of the limited company you and your wife can loan money to the company without any tax implications. The money loaned will be repayable to you both as and when cash flow allows and will show on the balance sheet as a creditor. One director can loan all of the money or it can be split between you both. Whilst it is not a requirement to have a legal document in place stipulating the terms of the loan/s it is best practice to do so, especially if the company will be paying interest to you both at the appropriate market rate. As accountants who provide services for Special Purpose Vehicle Limited companies if you are going to be receiving interest from your limited company for the loan then it is worth noting that each individual can receive up to £5,000 interest tax free depending on your other earnings. I have been covering the running costs of Ltd. company (website, rent ect) from my personal bank accounts. on the company’s balance sheet I have recorded it under creditors- Directors loan account, even though the money hasn’t directly gone into my business bank account is this correct? on my P&L accounts sheet I have recorded under expenses what I have spent this money on. if I didn’t put this on there it would be a pretty blank sheet! I work full time and this is a small business I run on the side, until its in profit. FYI everything I have paid for also have the company name on email receipts to prove they are for my business. You can pay for business expenses personally and as you say, these should be shown as money owed to you in the company’s accounts (i.e. a directors loan creditor) and as expenses on your profit and loss. You are correct in that the expenses should preferably be in the company name to reflect these are incurred on behalf of the business. 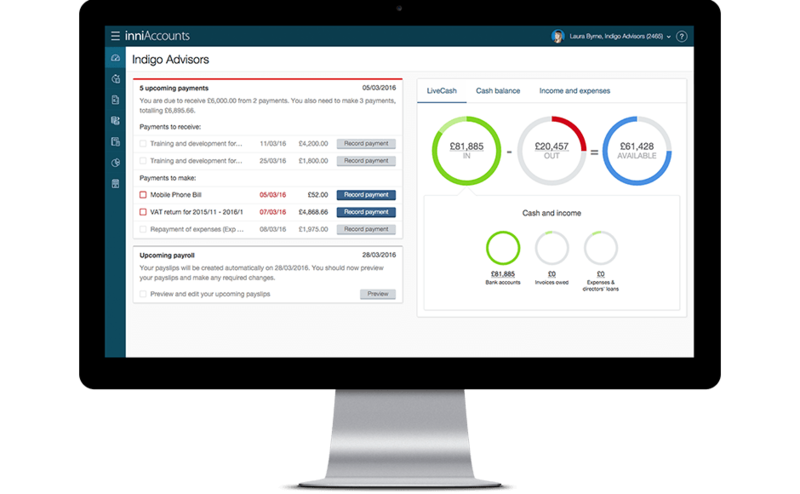 Our software has a feature which allows you to record privately incurred expenses and match these in to the business bank account when they have been repaid. Hi Rowena, firstly thanks for this useful page! I am owner and director in my limited company, I sent an initial funding at the beginning. o I have to charge my company for the interest rate or may I opt not to charge? I am asking to understand if I can avoid the complexity out of CT61 forms etc. As an owner-manager of your own limited company, you are not required to charge interest on any funding you provide to your limited company. Generally speaking, the majority of such loans are provided interest-free and repayable on demand. Any funds taken from the limited company to repay loans would be tax-free. Charging interest could have some potential tax incentives but you should discuss this with your accountant/tax advisor. As contract accountants, we can not help with your query. You would need to seek tax advice from an accountant who specialises in LLP structures. I am purchasing a small business for £7,500 out of my own personal funds. Can i class the £7,500 as a Directors Loan on the company accounts? Obviously i want my start up capital back without tax implications. When buying a limited company generally speaking you are buying the shares from the previous owner and this would not be a loan to the business. If you buy shares the cost of these shares would be a deductible amount when you come to sell your shareholding. If you want to structure your purchase for tax efficiency it is advisable to seek the support of a tax advisor before making the purchase. Hi my daughter who is not connected to my limited company loaned the company £160,000 back in 2014 and now would like her monies back,can i just repay her her loan in an online payment? and are there tax implications?? i am the only director and have been advised i will be taxed £53,000 which i don’t understand…. If your daughter loaned money directly to the limited company then it should have been treated as a loan in the company’s accounts in which case the company can repay the loan as and when cash flow allows in line with the terms of the loan. If you are personally withdrawing the funds to pay your daughter back then this will be treated as a director loan which will incur 32.5% Corporation Tax if the loan is not repaid to the company 9 months after the year end (£160,000 x 32.5% = £52,000). I have run a limited company for several years which has been more or less loss making year on year. Each year I have injected cash into the business to cover overheads and to support what is effectively my hobby business. My last-submitted accounts show £9500 on the Balance Sheet as a loan liability. I have not charged interest and do not want interest, nor do I want or expect the money back. I would now simply like to write off the debt, so that the company can tick along debt free (I am in my 70s). I assume that I can simply put £9500 into the Director’s Loan account so that it shows as zero. When reporting accounts it is a requirement to show a true and fair view of the accounts and if the company has been supported by you as a director through loans then these should be reported accordingly. If you are going to write off the debt you will forgo the right to recover the amount in the future. The loan on the balance sheet will be reduced to zero but a double entry to the profit and loss as income received is generally required, and any taxation should be calculated accordingly. If you no longer require the company then having an outstanding loan owed to you as a director generally will not prevent any closure. Hi, if have paid a business expense of £75 using my personal credit card, and the company has funds to pay this money back to me, what records do I need in place for these transactions? In this case money didn’t go in to the company from my personal funding as it was an expense, but I need to create a record in the directors loan account reflecting that the company owes me money. How do I make sure that the balance remains at 0 in the directors loan account (as it is not a loan from the company to me)? You need to keep a record of all expenses that you have paid personally and that you have been reimbursed for. You can do this by recording the expenses and showing them as outstanding on your expense account (i.e. debit expenses, credit director expenses owed (other creditors)). Our software allows you to enter business expenses paid personally as and when they are incurred by using our app and this will create a pending payment to you as a reminder that you are owed money from the company. I have a two bed property that I own outright. Can I sell/transfer this property to my lmited company as an interest free loan? I have just set up my limted company for this purpose. Will i have to pay any tax when the company repays my loan? When dealing with property and moving the personally owned property into an SPV Ltd company it is best to seek tax advice in regards to this ensuring it is the right thing considering your specific circumstances to do so. If you do wish to transfer the property then this can be done as a directors loan and any repayments of the loan are not considered taxable. Hi, I have a DLA of about 100k which I will have to pay c £30k tax on. Once I have paid that tax, do I have to pay that amount each year until the DLA is cleared? When you do not pay a directors loan within 9 months of the accounting year end the loan was taken then you are taxed at 32.5%. The company pays this tax along with its corporation tax bill. Once you have paid the additional loan tax then there are no further taxes to be raised against the company on this amount. However, should you borrow any additional funds from your limited company this may become subject to the additional tax charge. Any corporation tax paid on directors loans can be recovered 9 months and 1 day from the accounting year end the loan is repaid. I used my personal account to pay for start up costs for the business at the beginning as I had no business account /also I still do pay for business related things from my personal account as I only recently received payments from my clients into the business account. I wouldn’t be able to show any transfers from my personal account to the business account as a loan, would I just document this for the years end on my excel sheet /book keeping and transfer the money over which the business owes me? When buying goods and services on behalf of your limited company you are covering the expenses of the company personally. These costs can be repaid to you once the company has funds and may be allowable company expenses to reduce corporation tax. Our software provides an expenses section where you can easily manage any costs incurred personally on behalf of your company. Hi, I have an overdrawn directors loan account which will be paid before my financial year ends. I do however plan to pay myself dividends in the interim – if paying myself an interim dividend with an overdrawn directors loan account leads to a negative balance on the P&L is this an illegal dividend? If we exclude the directors loan the P&L (accounting for current tax liability is positive) – Just want to make sure I’m not doing anything wrong so to speak. Thank you! Dividends can only be raised from available profits so if the company has enough profits to cover the dividends they would not be considered illegal just because you have an outstanding directors loan account. Any directors loan would not form part of your profit and loss account as this is a balance sheet item. Our software is designed to make the management of your directors’ loan simple with the ability to match transactions directly to your loan account. We're a multi-award winning, innovative accountancy practice who use cloud technology to deliver an efficient, accurate and reliable accountancy service to contractors, freelancers and small businesses. Get expert tips on tax savings, IR35 plus much more straight to your inbox every 6 weeks.